Quote Reply Topic: Exhaust Gaskets?? Picked up my rebuilt engine from the builder. I have had the stock exhaust manifolds cleaned and painted, and I am putting them on stock heads that have been rebuilt. The builder tells me that I will not need to run exhaust gaskets (metal on metal) and I should be OK. In fact he recommended not putting them in. Has anyone heard of that before? My 1983 258 came from Kenosha metal to metal. I put gaskets on during rebuild. Me personally I prefer gaskets. The White70JavelinSST V8 came from Kenosha without exhaust manifold to head gaskets. Over 50 years and 140K miles later, still no gaskets, still no trouble. I really don't see the need. Just my two cents worth. 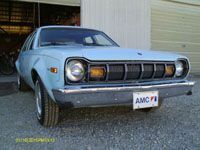 I have rebuilt several AMC's and have not used gaskets. Works fine. Personal choice I think. Thank you all. I appreciate the feedback! Manufacturers (AMC was not the only one) did not use exhaust gaskets because the parts were new and true. Exhaust manifolds have a tendency to warp because of the excessive heat. The leaks manifest during the removal and replacement of the manifold. That is why gasket kits include exhaust gaskets. Do all manifolds warp? No. Can the manifolds be machined true again? Yes, but gaskets are cheaper. The answer to the question about whether to use or not use the gaskets on your engine is simple. Don't use them. If you find there are exhaust leaks, then put the gaskets on. Some will argue there is better flow without the gaskets, and they are correct. However, on a street driven car using factory exhaust manifolds, the difference will be negligible. If a non-warped manifold that would seal without a gasket is used with a gasket, it will soon become warped or pitted and require a gasket forever. Getting a machine shop to PROPERLY reface a manifold or head to not require gaskets is near impossible. They often screw things up worse. The bad news is a warped manifold or head without a gasket will leak, but the leak won't usually get worse unlike a gasket blowing out. I try to get away without gaskets if possible. Otherwise, Remflex gaskets. I blow out all other kinds of gaskets with my heavy right foot. Remflex are the BEST exhaust gaskets I have ever used! One Bad Rambler, you must have good oak or a place with good humidity control. I find using a piece of float glass works very well for checking flat and lapping. An old large coffee table with a piece of 5/8" glass. My buddy uses a piece of granite from a broken kitchen counter top. DON"T bring car parts into the kitchen. Last time I was caught with pistons in the dishwasher it was pure heck! If you take your time with a file and then grades of paper, you can get old manifolds flat yourself. I find some machine shops not very good at setting up properly to machine the faces and you get back worse then what you send out.